For the first time you can now also celebrate the New Year here with a group booking. It seems like a long way off doesn't it but of course there is only one opportunity for a group to book this space at Pickwell, and as our previous guests we wanted you to be the first to know. The available dates are 28th Dec to 2nd Jan and the price is £6000 for up to 27 guests. Group booking which includes Bliss, Affinity, Grace and The Chapel, sleeps up to 27 and you can even bring up to two dogs staying with you in Grace. Perfect for a special birthday or wedding anniversary that you can share with friends and family. And at only £111 per person for 3 nights, it is amazing value as well. If you have stayed here before you will know what a very special place Pickwell Manor really is. Relax and unwind are the two words we here most often from our lovely guests. As well as our Pickwell chocolate bunny hunt, there's lots of things to keep you busy over the Easter holidays. Beach clean, Croyde Craft Market, National trust Easter Egg Hunts ( 10th - 22nd April) on Baggy Point and Woolacombe, St. Georges family walk on Good Friday followed by refreshments. New managers Simon and Julia have arrived and so have new animals Kensa and her daughter Magsy. Your children will love our pets corner - feeding the animals and collecting the eggs from our very friendly chickens - so why not find a date in your diary and join us for a short or long break in this beautiful part of the world. For the last 30 years, our home has been the Derbyshire village of Whaley Bridge, and so North Devon is quite a change - but what a change. We have had some fabulous weather for February and splendid Camelia's adorn almost every garden, and the daffodils are already in full bloom. We are going to enjoy the climate. We have loved exploring the magnificent Putsborough beach - arguably one of Britain's finest, with its huge breakers, so loved by the surfing community. A short drive away we have discovered Lee Bay, hosting a multitude of rock pools at low tide, evoking so many childhood memories as they reveal their hoard of seaside treasure. 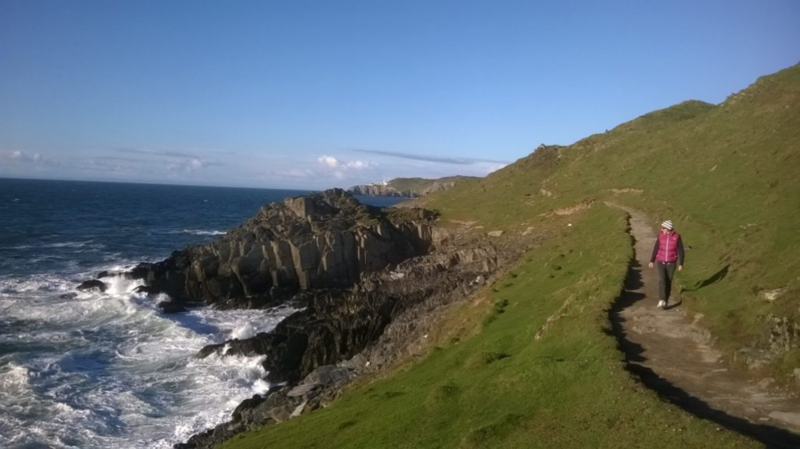 Our first walk along the headland at Morte Point boasted stunning views along the coastline and across the ocean to Lundy Island - then followed by an excellent Carvery dinner at the Chichester Arms at Morthoe. We feel very blessed. Perhaps though, it is the people that make Pickwell so special, and the warmest of welcomes we have received will also always be extended to you. If you are able to come - as repeat guests or for the first time - you will find many old friends and some new. Along with new accommodation in the form of our superb and romantic tree houses and magnificent apartment - Grace. Both Amity and Grace are now dog friendly so your pet can enjoy your holiday too. And new for 2019 - Can you imagine celebrating New Year in this amazing place. Well now you can make a Group Booking and bring in the New Year in style. Holly, Ben, Tilly and Thea are leaving us at the end of March to start their own new adventure. They would like to say a huge thank you to all the guests over the last 3 years who have made their time here so special. Please do say hello if you bump into them on the beach or in the local pub! We wish them every success and happiness. A journey on Bikes/Scooters/Feet to meet the ducks and drink and feast! One of our favourite hidden secrets. Perfect for a short break away from the beach! All you need to know to explore the hidden Lee Bay for rock pooling and adventuring!